Global demand for emulsion polymers is forecast to advance 4.2 percent per year to 12.5 million metric tons in 2020, valued at $37.2 billion. Performance in the Chinese market -- which is forecast to account for over one-fourth of global sales in 2020 -- will continue to shape global demand trends, though India will provide the fastest growth of any country in the Asia/Pacific region. Acrylic-based emulsions will remain the largest and fastest growing single product type through 2020, driven by greater usage in paint and coatings. 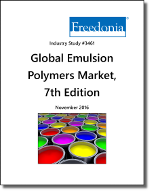 This Freedonia study examines the global emulsion polymers market, presenting historical demand data (2005, 2010, 2015) plus forecasts (2020 and 2025) by product (acrylic, styrene-butadiene latex, vinyl acetate polymers) and market (paint and coatings, paper and paperboard coatings, adhesives, carpet backing) in 16 major countries and 6 world regions. The study also provides company market shares and competitive analysis of industry players including Arkema, BASF, Celanese, DIC, Dow Chemical, DSM, OMNOVA Solutions, Synthomer, Trinseo, and Wacker Chemie.